Bet you thought this blog was DEAD! Well, I have been neglectful in feeding it .. it needs nourishment, some TLC ... maybe even total resussitation! I truly am a hot mess when it comes to blogging. But I keep coming back so I hope you will too! While I have been letting the blog linger, I've been breathing new life into Mama's Pocketbook and I'm finally good with the way the website is shaping up. It's not perfect, but then again it never will be. That's ok, those of us who love the pretty things, the creative souls, the sweetness of life don't really want perfectionism. We just want to love what we love and love what we do. Right? SO... I have some very pretty new Cross Body Bags and Sienna Handbags to share, as well as some NEWS about our forward progress here at Mama's Pocketbook. I announced it on my Mama's Pocketbook Facebook Page that my fiance, Kim Long, is joining me as co-owner of our business and bringing us his wealth of knowledge in sales and marketing, and taking control of the business side of things to give me more time for the creative side of things. This is a dream come true for me as a fabric artist who prefers the creative side to the business side. Kim will be updating the website, newsletter and yes, this blog will get new life under his care. He will wear many hats here ... writing content, shipping orders, bringing me frappacinos (made on my new Nutra Ninja Plus! ), and other duties as assigned. (Yes, I'm still Queen here). Happy Spring Everyone! I'm Back! Finally Spring has sprung here in Georgia. And I feel as if finally Spring has sprung in my life and heart. I am happily creative again after a very long healing and rebuilding period in my life. I am so grateful to all of you who have patiently waited and stayed supportive of me as I focused on more personal life events. By God's immense Grace I am here today, feeling very strong, loved, capable, excited ... actually PASSIONATE again about my creative work. So ... Here's what I've been doing behind the scenes to prepare for this beautiful Spring! Over the past six months or so I have been very busy not only with the website update but with quite a lot of custom work. I love making custom items and stretching myself creatively. I created several custom bags, altered & embellished jean jackets, bridesmaids clutches, curtains, and various one-of-a-kind items. I have not been idle by any means, but I am very excited to be creating again for Mama's Pocketbook and my other budding venture "Prissy Gypsy" - there will be more good things to come for that label for Spring and Summer so please stay tuned for some scrumptious lacy, boho, altered goodies there. I'm really excited to be creating new designs, some inspired by other artists who have graciously offered their patterns for artists like me to use for resale, and some of my own designs of course. 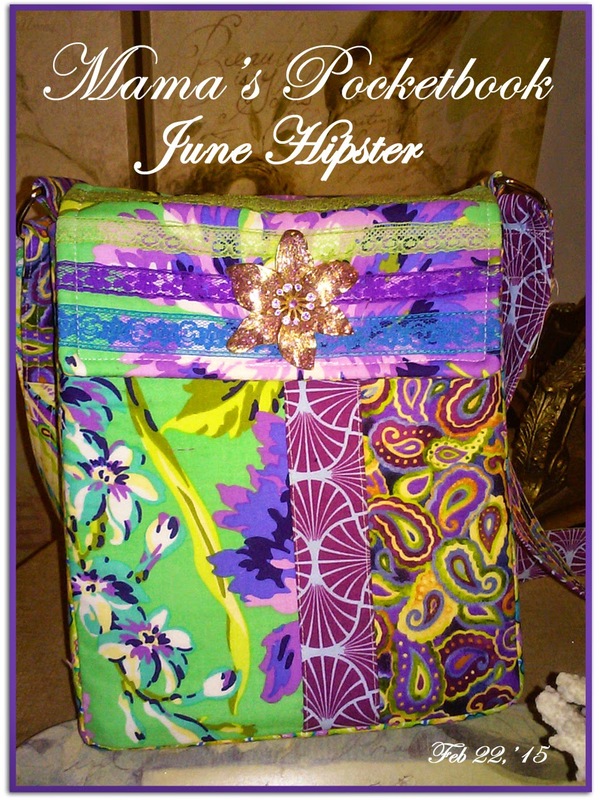 Below are my three newest offerings based on a pattern called the June Bag by Melissa Mortenson of Fourteen May . I've added a few touches of my own - adjustable strap, and extra pockets inside, trimmings and vintage brooches to name a few. I was really inspired by this pattern because it lends itself to my signature mix of fabric colors, patterns and textures. More to come of these and many other designs! Thank you to all who take the time to read my blog. I am blessed by you!! One of a Kind - In stock - READY TO SHIP NOW! is a One of A Kind Original Design! What beautiful fresh Spring colors! This is a one-of-a-kind tote set with accessories! I've fashioned my basic tote pattern from a gorgeous print called Caitlin Blooms by Alexander Henry and coordinated the outer pocket and interior lining with Amy Butler's retired Okra Eyelashes from her Belle collection. 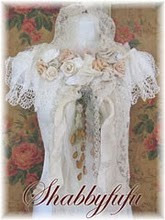 The tiny ruffle and fabric flower are created from another retired Amy Butler Belle fabric called Chrysanthemum in Okra. These fabrics are no longer available commercially, so you will definitely have a OOAK set! The outer shell features a large lined slip pocket with a cute little ruffle, fabric rose and a perfect vintage dragonfly pin! Not only is it gorgeous on the outside, inside it is also lined with Amy Butler's Okra Eyelashes fabric and there two slip pockets on one side that are perfect for cell phones, cameras, iPods or other small electrical devices and a large pocket on the other side that will hold your Kindle, iPad, Nook or other larger devices. There's plenty of room to spare inside for all your other essentials as well! And the included card cases/organizers and tissue cover all help keep this tote organized and ready to serve you as a great day bag or shopper! All pockets are fully lined and corners are securely V-stitched, of course… nothing is ever flimsy about my bags! 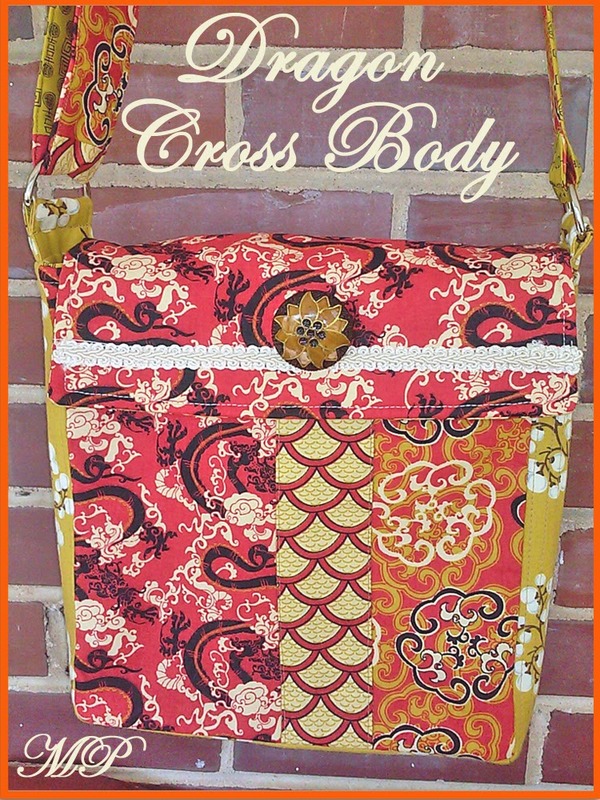 12" drop padded and channel quilted shoulder strap from shoulder to top of bag. 11.5” tall and 14” wide, this bag wears comfortably and securely against your body. Perfect for shopping, antiquing, treasure hunting, and all manner of outings! 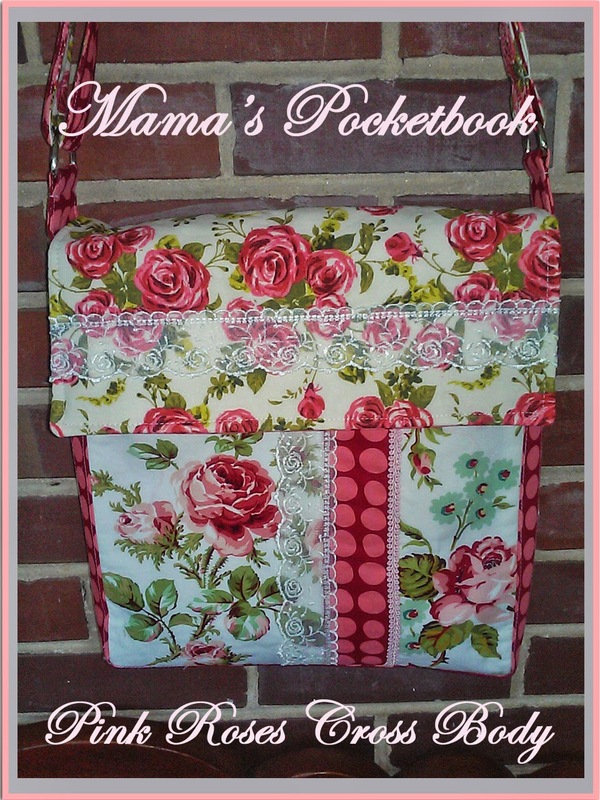 Mama's Pocketbook - Miranda Hobo Sling Bag is my newest creation. I’m so happy to present a new Miranda Hobo Sling Bag. This is a One of A Kind Original Design! I have also created some optional accessories: A set of 3 coordinated card cases to help organize your new bag. These bright colors are sure to get your attention - and everyone else's attention too! But only one lucky girl can carry this bag because it is truly a one-of-a-kind! The outer shell features coordinate fabrics with huge roses - black background on one side, red on the other. I believe these are Kaffe Fassett fabrics. I bought only one yard of each print quite a long time ago and cannot find them anywhere again. 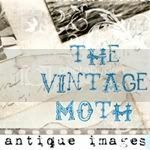 The beautiful butterfly fabric is authentic vintage fabric by C S Shamash & Sons. There are 12 colors in this gorgeously detailed print on black background, picking up all the colors in the other two fabrics. The fabric is strong and in like new condition, having been carefully stored and protected. I have used a lightweight sew in interfacing to add additional shaping and support to the fabric as well. Not only is it gorgeous on the outside as a large lined pocket that has a velcro closure. Miranda is also lined with this beautiful butterfly fabric. There are two slip pockets inside with ample room for your cell phone/camera, iPad, tablet, or reader and plenty of room for other purse essentials and organizers. All pockets are fully lined and corners are securely V-stitched, of course… nothing is ever flimsy about my bags! Closes with a black magnetic closure that is securely installed with additional padding and stitching so it will not tear the fabric with use. As with all my designs, you'll also receive a matching tissue cover with pretty printed tissues. Other matching accessories are availble as well! 14" drop padded shoulder strap from shoulder to top of bag. 11.5” tall and 16” wide, this bag wears comfortably and securely against your body. Perfect for shopping, antiquing, treasure hunting, and all manner of outings!